Thanks for checking that and correcting me I'll have to dedicate some time to see what kinds of shops do and don't carry third-story inventory. Hello, everyone. I've moved on from the region of Daggerfall to Shalgora. If anyone is interested and would like to tackle a region, here is what I've been doing. When pressing "v" turn off dungeons, temples and homes, then check each row of towns. In each town, visit every building and click on all containers, taking note of the ones that are not clickable. If you feel like doing this, pick a different region and post here which one you chose. 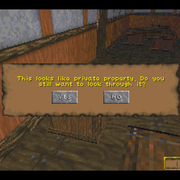 I keep a look out for shop shelves that are not clickable and shelves in town residences that don't display the private property menu when clicked. I also make sure that I save when I finish exploring a town before I move on to the next. I'll keep you posted and if you take on a region, you keep us posted too. Aeuc wrote: Hazelnut, I found another shelf that needs fixing. This shelf is common on the top floor of shops and is also found in many residences. Usually this shelf is clickable, but this one is not. In addition, this shelf is sometimes clickable in residences as private property, so you might want to double check that the IDs of this shelf are in the private property list as well. 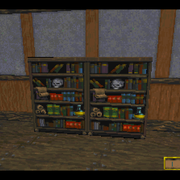 I have 15 more towns to check out in the Daggerfall region then I'll move on to another. As usual, I've included a photo. I will need an example of this shelf being private property - I'm hoping that it's a different model that just looks the same. 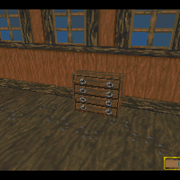 I'm 99% certain that when I was a teenager playing Daggerfall up through my college years, that every shop that had a third-story, followed one of three presets on the third floor: a shop container, a private property container, or an empty space. 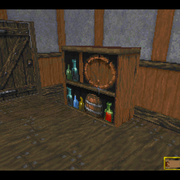 In Daggerfall Unity, you guys already have more clickable store containers than you do non-clickables and the ones I've found so far that are not clickable in DFU are indeed clickable in classic. I just don't remember non-clickable shop containers in classic. 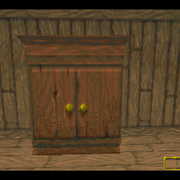 In addition, when I watch old bookmarked YouTube videos of people playing Daggerfall in Dosbox, not once have I seen them fail to click on a store container. I do have Dosbox setup, so I will start comparing each before posting from now on, but I think you guys are wrong about non-clickable shop containers. I decided to dedicate a little time to it. You were right, Aeuc. My simple rule of "always" or nothing needed serious revision. I can at least show the following for the city of Daggerfall, which I would at least extrapolate into the whole region thereof (playing it safe, at least). Shelves carrying barrels, such as these, should be non-interactive. Tall cabinets such as these are often private property. I feel some should be non-interactive, but I need to find an example of it. Bookshelves such as these should carry goods for sale. Small dressers such as these are variable. This one, on the top of a third-story pawnshop, was non-interactive. They are often private property. Boxes not found in dungeons should be private property, regardless of size. If it would help to provide specific locations, I can do so. I consider these to be fairly firm rules, at least from my experience, which was always in the northwest regions of the game. Thank you for doing this. I've been watching the commits on github hourly and in a few days, I plan to upgrade to latest git to stay current instead of using live build #98. Testing on "bleeding edge" code seems the way to go for someone like me. What you say seems fair and I will keep you posted if I run across anything that conflicts with those rules; like different containers. Hopefully, that doesn't happen, but you never know.